Kyle Watson Promoted to Director of Casualty Response - Global Diving & Salvage, Inc. Global is pleased to announce that Kyle Watson has accepted the position of Director of Casualty Response, the lead executive position for the Casualty Response Group at Global. Mr. Watson has been serving as the interim Director since mid-December, overseeing a number of large-scale projects, working with clients, and developing Global’s strategy for emergency response. The position is based out of Global’s Seattle office. 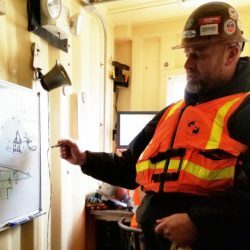 Mr. Watson joined Global in 2003 and has served in a variety of roles including Environmental Operations Manager in Seattle, WA; Environmental Operations Manager in Richmond, CA; and most recently as Salvage Officer. He has been involved in many of Global’s highest profile casualty response projects over his 16 years at the company. Mr. Watson graduated from California Maritime Academy in 1999 with a Business Administration degree.